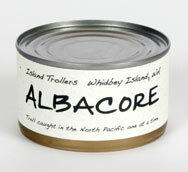 We offer custom canned Troll Caught Albacore. Each fish is caught one at a time in the beautiful waters of the North Pacific. We are proud to be involved in this sustainable fishery off the West Coast of the United States. Each BPA Free can is raw packed with troll caught Albacore and cooked only once. This is sashimi grade albacore in a can, the finest you will find anywhere in the world!